Effi Rosen, a singer with a ringing voice, considered a rising star in the world of Hassidic music, presents his debut album. Rosen, aged 30, married and the father of five, lives in Ashdod. In his youth he was the soloist in youth choirs under the direction of Yishai Lapidot, but that was only the beginning. Having performed on stage for years, and following “Hadoch Kamai”, a brief taste which attracted much attention, comes the full album. 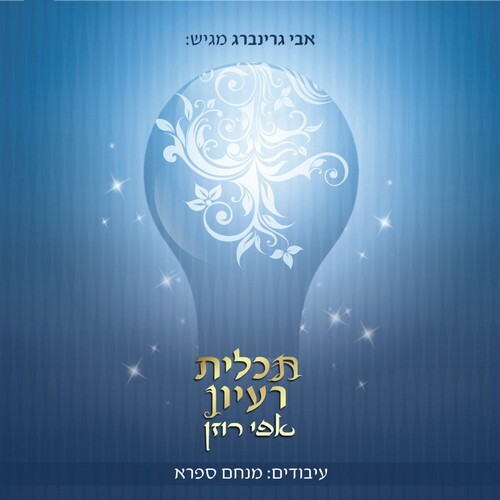 The disc Tachlit Ra’ayon is colorful and somewhat different from the usual Hassidic music. It is on the one hand laced with familiar Hassidic motifs, but at the same time introduces and blends a wide variety of styles. “We didn’t want to bore the listeners, so we broadened the style range of the album”, says Menachem Safra, the producer responsible for the arrangements. It includes a number of rhythms not generally found in Hassidic music, such as samba, bossa nova, metal and others. The music was composed by Effi Rosen himself, as well as Menachem Safra, R’ S.M., & Hanochi Polak, whilst Menachem Safra was in charge of arrangements. The entire album was recorded at the artist’s house, in a state-of-the-art, purpose built studio. The idea was to allow the singer to develop the music freely without limits. Those working with Rosen were hand-picked in order to produce a high quality product. Rosen rises well to the challenge, a fact which raises the expectations for future albums. Produced and distributed by Greentech, Israel’s leading Hassidic Music company.